A documentary film by Werner Herzog about a pilot shot down in jungle during the Vietnam war. Anchor Bay USA R0 boxset + DVD release. Dieter Dengler grew up in Germany during the Second World War and watched as Allied aircraft flew low over his village. After the war he was captivated by the idea of being a pilot and once turning 18 left for the United States. In America he joined the Air Force, but found himself working in the kitchens on motor pool, so after moving to California and graduating from college, he joined the USNavy as a pilot. His aircraft carrier moved to South East Asia where the Vietnam war was in its early stages, on his first flight over the country his plane was shot down by AAA and crash landed in the jungle. Surviving a few days on his own he was captured, first by Laos milita, then handed over to the Viet Cong. Eventually he managed to escape, along with a fellow pilot named Duane. Although Dieter was eventually rescued, Duane never made it to safety and was brutally killed by a local villager. Little Dieter Needs to Fly is a relatively straight forward documentary for a Herzog film. Dieter himself takes up most of the run-time, telling the story of his life, Herzog adds some narration in a few scenes but largely leaves the work to Dieter. The film avoids the 'talking head' syndrome of most TV documentaries by talking Dieter to the appropriate locations for when he is talking - so discussion of his time in the Navy takes place on board an aircraft carrier, and in the cockpit of a plane similar to the one he would have flown - for the sections of the story in the jungle, Dieter is actually filmed in the jungle, and recreates his experiences. The tone of the film is relatively light, Dieter seems to be enjoying himself most of the time, and the film actually borders on comic when Herzog comments on a daft US-Navy jungle survival training film, although it is very respectful during the discussion of Duane's death. The film did receive some criticism on its theatrical release because it did not condem the US agression in Vietnam - as it is, the film avoids any political statements and makes few comments on the war itself, being focused almost entirely on the story of this single downed pilot. Herzog's direction is pretty standard here, he avoids the annoying over-direction and flashy camera-work of most modern TV documentaries, letting the story tell itself most of the time. There is some stylisation although it is subtle and merely helps to emphasise the story. As expected, there is plenty of stock footage of the war - although Herzog avoids going overboard like some documentaries do, and it is well edited into the story. The use of music is very good and gives the film a suitable atmosphere. 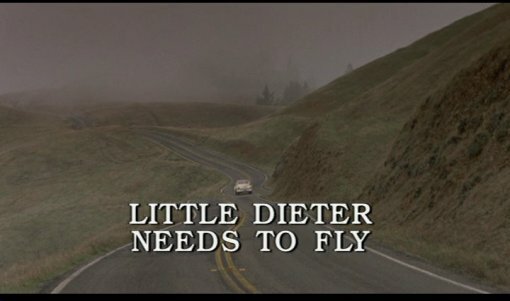 Ultimately, Little Dieter Needs to Fly is a minor entry in Werner Herzog's oeuvre, although it demonstrates the professionalism he brings to even the smallest productions. The story is what keeps the film moving and is a fascinating look at one man's fight for survival in the jungle. A good chance to sample one of his documentary films, Little Dieter Needs to Fly is recommended to Herzog fans. Anyone looking for a documentary on the broader Vietnam conflict will be disappointed, but if you enjoy tales of survival, this is for you, and is a step above the endless Discovery Channel documentaries. As an endnote, the story of Dieter Dengler is currently being made into a feature film by Werner Herzog, with actor Christian Bale playing Dengler. Any violence/gore? Nothing seen, but some vivid descriptions of death and injuries. The print quality is very good with mild grain. The stock shots are obviously much grainier with notable print damage. Cuts? None known, this is the longer cinema print rather than the television version of the film which ran to only 40 minutes. The film includes a short epilogue showing Dieter's funeral in 2001. English language print. An interesting and well made documentary, of interest to Herzog fans and fans of survival tales. A decent looking print and audio. Low on extras.